Both the composition and construction of rope impacts on its performance on your boat anchor winch. 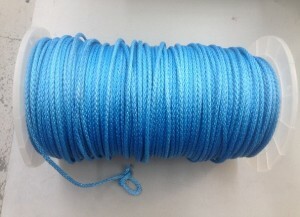 A variety of rope materials are available, many of which are suitable for use on boat anchor winches. The type of material used for the rope is the main determinant of the rope’s functionality – which include its strength, abrasion resistance (to prevent wearing and tearing), ease of use, and in addition price. The thickness of the rope for example will determine how much rope you can get on the spool/drum which will determine your anchoring depth. Due to this, it’s extremely important to have a rough understanding of the basic differences between the various rope materials available. Nylon is the strongest easily available rope material while also being relatively cheap. Although it is quite strong it does lose around 15% of its strength when wet. In most cases, this isn’t significant, though it should be factored into the rope-buying decision for applications where the rope will be exposed to water such as in a boat anchor winch. It should also be noted that it is very dense and sinks in water. Nylon is the best choice of rope for lots of applications. This includes marine, general purpose, and towing. It is very strong, but perhaps more importantly highly UV and abrasion resistant, so it lasts a long time. 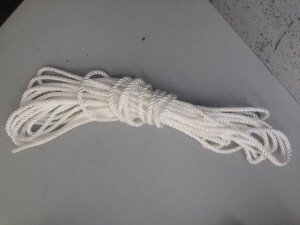 The most commonly available nylon ropes are white and may be marketed as “dock lines” or “anchor lines”. Nylon ropes excel at both of these tasks and have been dominating in traditional marine applications. The negatives for a boat anchor winch application is that they’re thicker in diameter than other ropes (usually come in 8mm, 10mm, 12 mm and thicker) so may not be suitable for deep anchoring if using a drum style boat anchor winch. Polypropylene rope is most popular due to its low price. It’s the cheapest of all synthetic fibre ropes. It is strong for its weight, but it is not very UV, heat, or abrasion resistant. For this reason, it is generally not a good choice for long term applications where the rope would be exposed to sun or abrasion (e.g. a dock line). Polypropylenes only redeeming characteristic other than its excellent price is that it floats. In some applications (e.g. rescue line) this is an important feature. Polypropylene is the best choice for budget conscious applications where the rope will not be exposed to abrasion or UV for extended periods of time or where buoyancy is needed. This includes cheap disposable twine, general purpose budget ropes, and infrequently used ropes. This rope is commonly available in yellow as “value packs” or as cheap twine sold in hardware stores. Due to all the above reasons it’s not a smart choice for use on your boat anchor winch. Polyester is almost as strong as nylon, but it does not lose strength when wet. It also has the highest resistance to abrasion, UV, and heat. The main difference between nylon and polyester is the elasticity – nylon stretches significantly more than polyester. Polyester is also more expensive and not as easy to work with. It is also more difficult to untie than nylon. Because of these factors, nylon is more appropriate for applications where slight stretch is desirable, such as dock lines or the core of dynamic climbing ropes. Similarly, polyester line is more appropriate for applications where stretch is not desired, such as lifting slings and hammock guy lines. It is not really suitable for boat anchor winches. In general, natural fibres are heavier, weaker, and less resistance to all forms of abrasion than synthetic fabrics. For this reason, there are few applications in which a natural fibre is preferred. Some specific applications where natural fibres are preferred include those where the roughness of the rope is beneficial (e.g. climbing rope). Natural fibre rope is also commonly used for decorative purposes. Not recommended for load bearing usage. Hence not suitable for boat anchor winch applications. 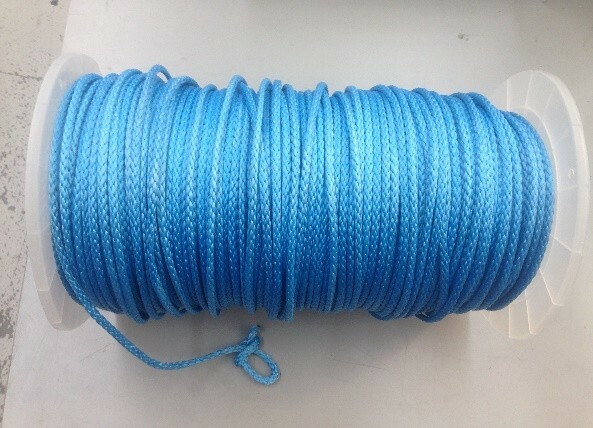 The rope of preference used in boat anchor winches and increasingly common is double braid. This double braid is over a decade old but performs extremely well and shows few signs of wear. A double braid consists of two single braids – one inside the other. This type of rope is much stronger than a single braid and does not lie flat. It is available in a variety of materials including polypropylene, nylon, and polyester. In some cases, a double braid rope will have two braids of different materials – the inside material is chosen for its strength, and the exterior material chosen for its abrasion resistance. 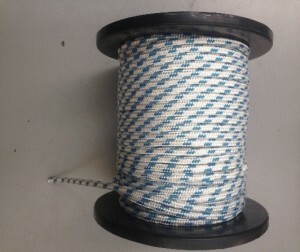 The other advantage with twisted ropes and why they are commonly used for anchor lines, is that most boat owners state openly that they greatly prefer double-braided nylon lines. They have plenty of strength and abrasion resistance, but it is the stretch that helps keep an anchor in its place. And double-braid nylon lines are a lot nicer in the hand and don’t kink up nearly as badly. Also important to remember that rope twisted or braided together lasts longer and is stronger. They have textile strength that is perfect for dragging and or lifting. Twisted rope allows the rope to retain its integrity but evenly distribute tension among the individual strands. 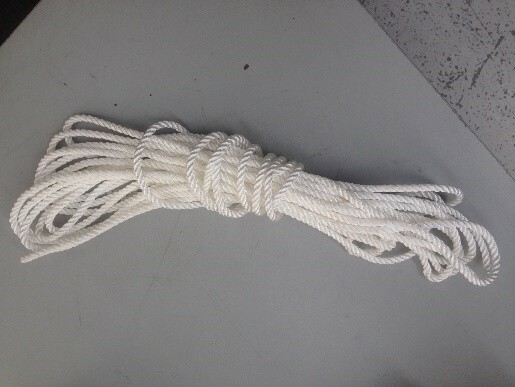 This type rope is recommended for use with our Savwinch boat anchor winches. Other new addition to the rope family is Dyneema rope. 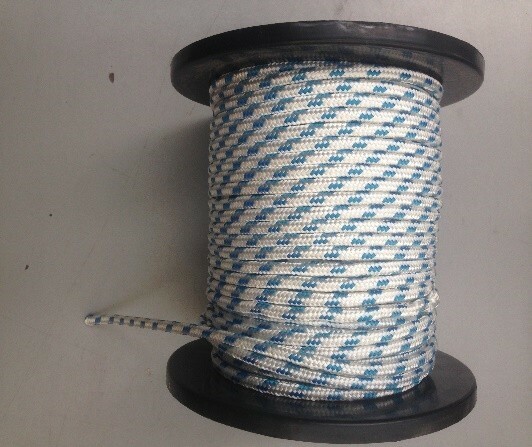 These newer type ropes are preferred for boat anchor winch applications that require much deeper anchoring depth than normal. This is made possible due to be able to fit more rope onto the drum because it has a thinner diameter and higher breaking strain. It is recommended to have at least double the amount of rope that you are anchoring in. Rope known as high performance polyethylene (HPPE), amongst other names. Is a subset of thermoplastic polyethylene. This rope on a molecular level has extremely long chains, increasing molecular mass. This results in one very tough material, with the highest impact strength of any thermoplastic. It is also highly corrosive resistant to chemicals, except oxidizing acids, has extremely low moisture absorption and very low friction issues. These properties make it an ideal boat anchor winch rope choice. The biggest negative is cost – it’s quite expensive and can cost about three times more than a double braid nylon rope. As boaters use drum style winches more, and if anchoring depth is increased or the requirement for more rope lengths on the drum, the demand for these newer types of rope will increase. This will hopefully help drive down their price making them more affordable for boaters and fishermen. At Savwinch the demand for these ropes has definitely increased over recent years. So watch this space.